It is Friday and if you pop down your local phone store you’ll seen an exciting newcomer on the shelves. The Huawei Ascend P6, which we wrote about a while ago, goes on sale today in several places including Carphone Warehouse , O2 and Talk Talk. So why should you take a peek? 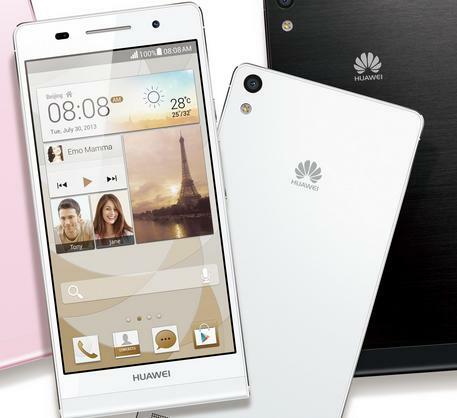 Well the Ascend P6’s biggest claims to fame is that its maker Huawei says it is the thinnest smartphone ever created. Its 4.7inch screen mobile comes in at just 6.18mm, which is slimmer than all its rivals. Features-wise it is pretty strong too with a 1.5GHz quad-core processor, 5MP front-facing camera (an industry record and a selfies fans dream), Android 4.2.2 operating system, 2000mAh battery,and a shed load of software. If you prefer taking images of other people then it also has a decent 8MP rear facing camera too that has F2.0 aperture and 4cm macro view and also enables 1080P full HD video recording and playback. It will be available in Black and White (though sadly though there’s no word on the pink one that was promised) from £21 per month on contract and £329.95 on prepay. Available in both black and white from £329.95 plus a top-up on prepay, and from £21 per month oncontract, depending on network provider. It is available from Carphone Warehouse on all networks. On sale with O2 in black from £299, plus atop-up on prepay, and from £27 per month on contract. It is initially available from O2’s telesales channels only. Further channels will make the product available shortly. On sale with TalkTalk in black on contracts from £20 per month. At launch, it is available for a limited period bundled also with the Huawei MediaPad 7 Lite.